Watch the entire panel in 4 parts online- no special codecs required! – includes coverage with David and Gillian and Chris Carter and Frank Spotnitz all at Wondercon- feel free to subscribe to my feed for this category as I will be adding X-Files news and interviews all year! Comments Off on X-Files 2 News from Wondercon! This site has both of the top most anticipated panel events from the weekend available to download in Quicktime and view on your computer! DO NOT hotlink to their videos, DO NOT view online from the link as this steals bandwidth from them- DO right click and SAVE AS to save to your own computer and enjoy! News is coming in from the X-Files 2 presentation at Wondercon in San Francisco this weekend and it is huge! 1st- they sneaked a trailer for the film at the panel and then the stars and creators talked about stepping back into the zone of doing the epic series as a movie again. Youtube user rhoboat77 also has coverage of the panel- in smaller clips. IESB.net got some excellent video interviews with the cast and creators! SciFi.com aka the SCIFI Network already has two articles up online from the event- I will let you know when they post the full panel as I am sure they will. They had the full panel recordings for the big events at Comic Con- cannot imagine them passing on this since The X-Files is one of the biggest shows they have in syndicated rotation. This fan girl’s heart is very happy this am! X-Files Ultimate has call sheets from the new movie and one of the guys in their forum has it confirmed THE SKINMAN is in the movie! I had been worried about no news on Mitch in the movie but it has been confirmed Mitch Pileggi is in the movie! Comments Off on Mitch Pileggi is in the new X-Files movie! X-Files 2 STARS in San Francisco in 2 weeks! For what is the first time as far as I know- EVER! 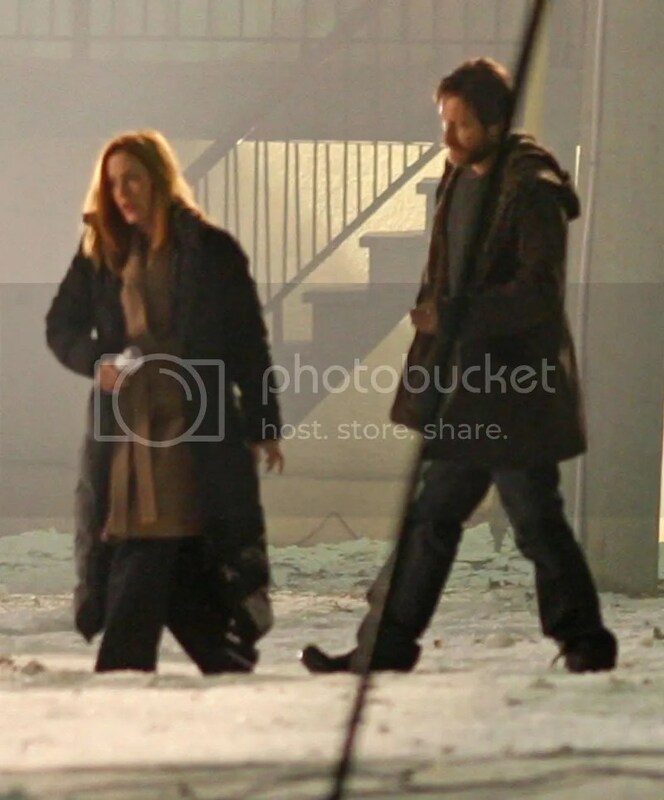 Gillian Anderson and David Duchovny will be leaving the frozen north of British Columbia and coming to San Francisco for WonderCon in San Francisco for a one time special appearance along with X-Files creator, writer and director Chris Carter and co-writer and producer Frank Spotnitz. They will be discussing the new movie and of course the series!!!!!! THIS IS HUGE! If I could I would go. They will be appearing on February 23, 2008 at the Moscone Center. This is just south of downtown San Francisco and has easy access by BART , Cal-Trans and even Golden Gate Transit. When you are done you can walk up a few blocks and shop in the excellent Bloomingdales and really have me jealous. Anyone who goes and gets pictures and can report on how it goes please shoot me a message! I will gladly post links to your blog/website so other fans can share in the X-Files coolness from WonderCon! Gillian Anderson is at it again- this is the second round of offering up a shot for a lucky winner and guest to be extras on the new X-Files movie in Canada! The last auction that Gillian offered on ebay in December closed at $13,000. All moneys raised go to charity and the winner gets the chance of a lifetime! Need more of an X-Files fix? And remember to pick up a nice new copy of Fight The Future while you are at it! Comments Off on Want to Be an Extra in The X-Files 2 Movie? Bid on Ebay! and some spoiler video from Flynet. 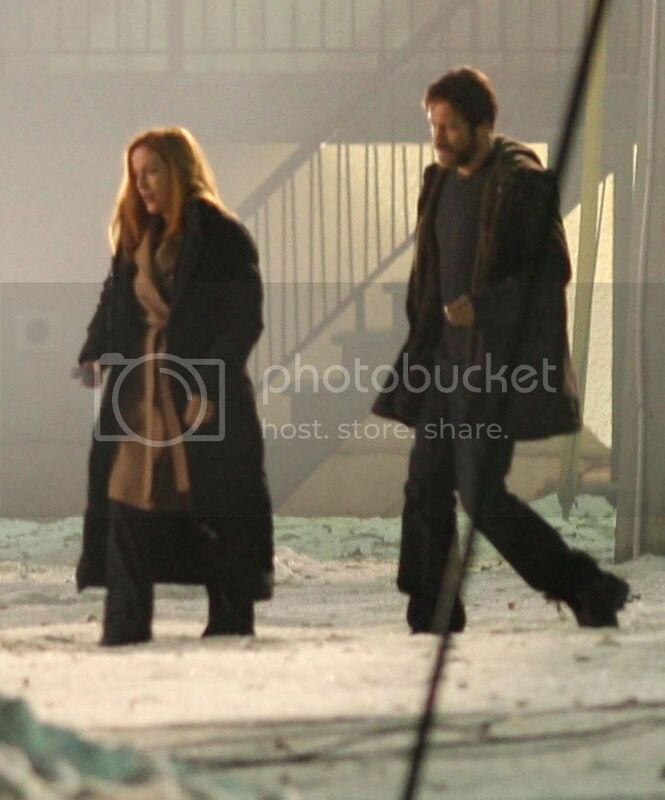 Login to XFiles news for pics in better quality. 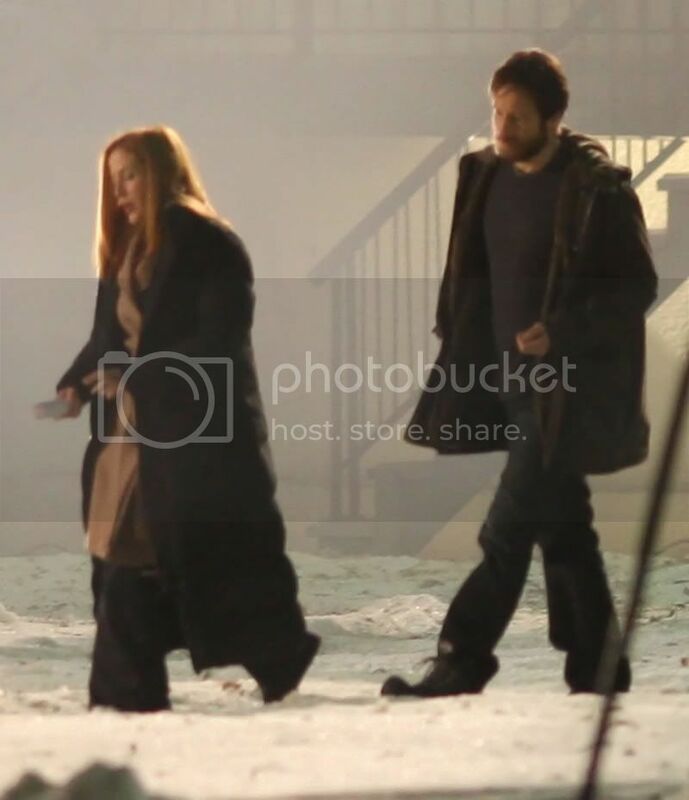 Click on photos to view full size– these are a scene with Mulder and Scully walking in the snow- am guessing it is before they are involved with the FBI again as Mulder has a beard and Scully has very long hair. X-Files 2 Sneak Peek 2!